As a medical practice, you have dozens of patients, employees, vendors and insurance personnel in your facility every day. Your practice is a business like any other business and you and your staff are the business owners and staff who are there to serve your customers (patients) like any other service business. Creative and attractive signs can help you create a welcoming practice that your patients feel comfortable coming to and hopefully recommending to friends and family. Treat your practice and marketing efforts as any other service business does and you will be successful in attracting new patients and increasing your practice revenues. 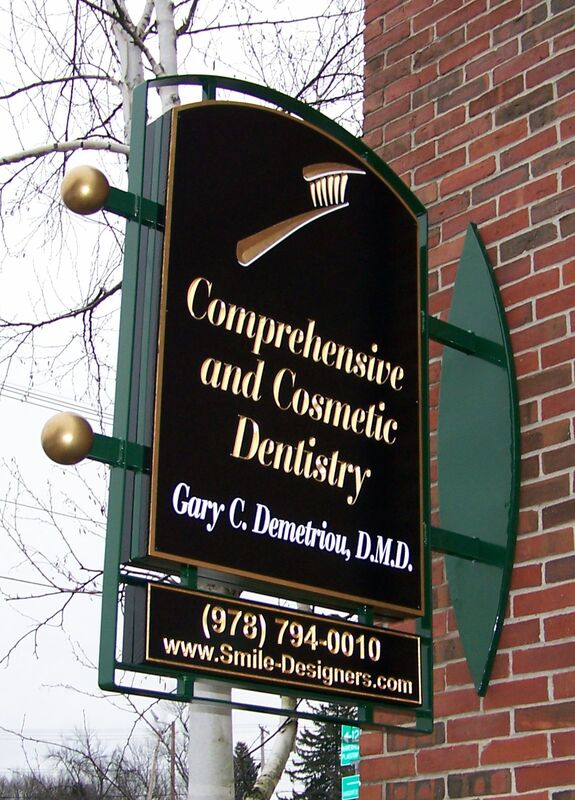 Why Should Your Medical or Dental Practice Have Signs and Branding? What is a brand? The dictionary defines branding as; the promotion of a particular product or company by means of advertising and distinctive design. Like any other business, a great medical practice should have a brand that promotes its products (medical care). A successful brand helps you to connect with your patients on an emotional level. It clearly defines your practice and confirms your practice values and credibility. A big smile for a dental practice gives a patient the feeling that they will be happy once they visit rather than a simple tooth which doesn’t the same appeal. 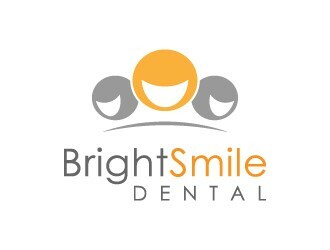 Which of these two logos is more comforting if you were visiting a dentist? Try to think out of the box. So many medical offices use the caduceus symbol and dentists almost always have a tooth in their logo. Differentiate yourself and be creative. Think of your prospective patients age, gender and medical situation to create an environment that appeals to them. A cancer care center should probably be a soothing and nurturing environment where a pediatric specialist might want to create an environment that appeals to children. The pediatric dentistry logo below is a little more fun and takes the scare out of visiting the dentist. Imagine how using attractive signs and graphic elements could make both inside and outside of your practice comforting and attractive for new patients. Utilizing the colors of the logo, you can create an environment that is a comfortable place for kids to get their dental care. 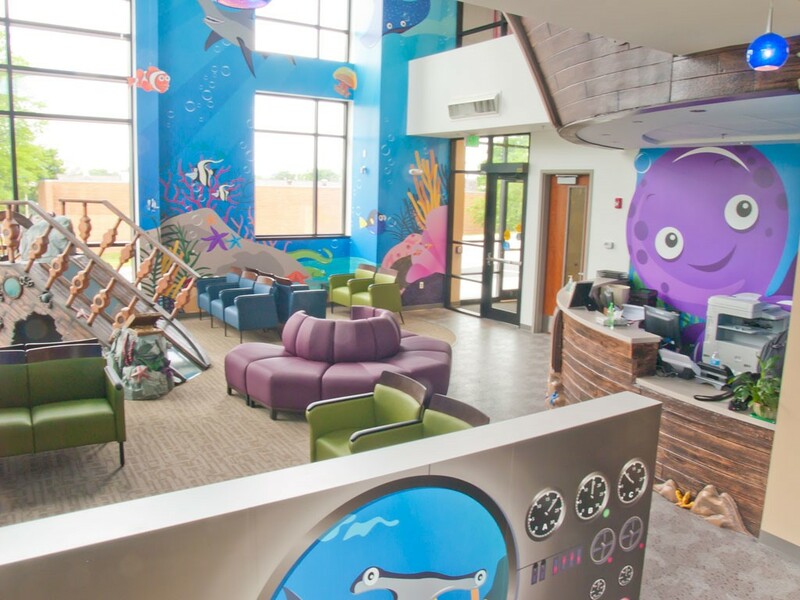 Full color graphics, custom wallpaper, dimensional signs and fun decorations make this a place I would want to have my dental work done if I was a kid! On the other hand, this logo and environment with it’s soothing blue and silver colors would appeal to and create a calming environment for adults. The professional setting, logos and environment will comfort patients and give them a welcoming feel. When choosing colors, research colors that create comfort, confidence and a welcoming feel. You are selling healthcare, not race cars. Keep that in mind. Bright colors like yellow and orange are jarring and can create a feeling of anxiety or even cheapness. Softer versions of yellow however can create a feeling of happiness and brightness. Colors like brown and black are rustic or edgy. Probably not what you want your patients to feel when they come into your practice. However, lighter browns used with other soothing colors can create a clean, warm, welcoming environment. Carrying these colors into your logo and signage further extends the branding effort. Blue creates a feeling of serenity and trustworthiness. While greens can create a feeling of nature and earthiness. Be careful with tone here as well because bright greens can be overwhelming and dark blue can create a feeling of somberness. Start with your exterior signage. 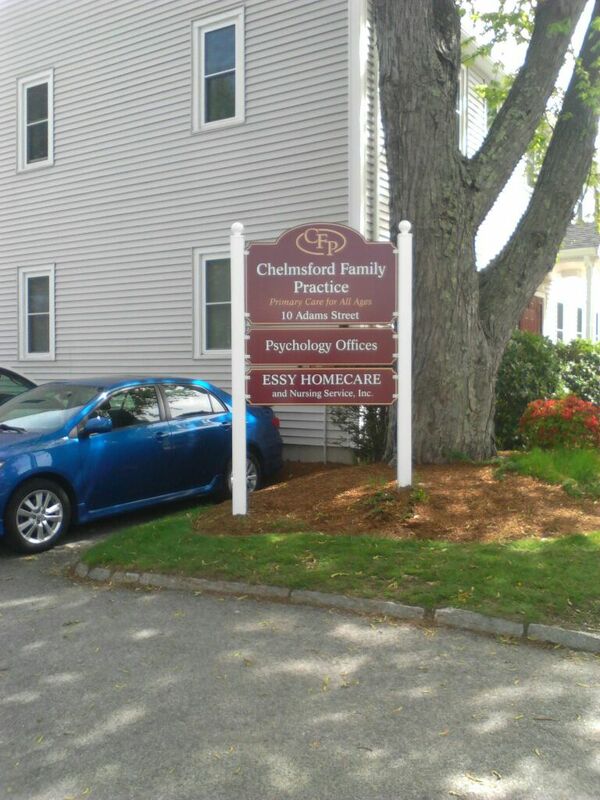 Be sure that your outdoor signs reflect what patients will find once they get inside. 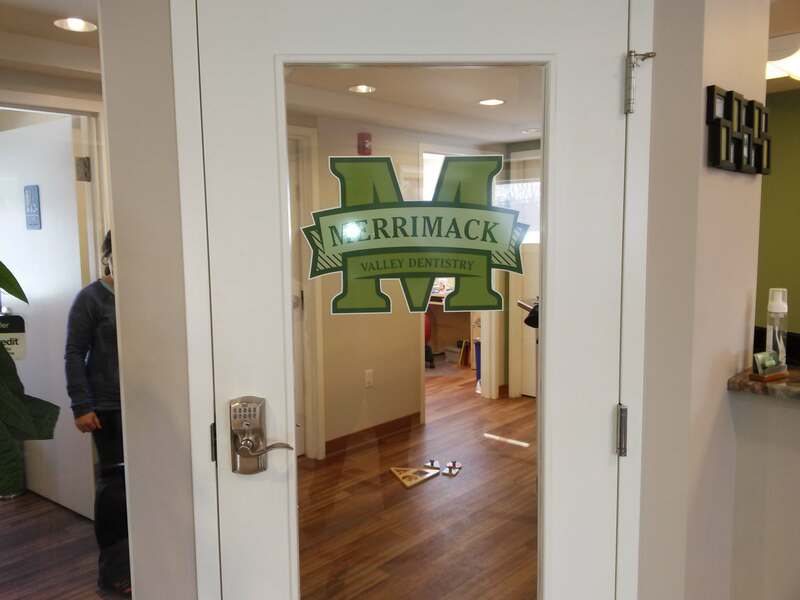 Easy to ready directories, parking signs that show where patients can park, directional and wayfinding signs to find your building entrances are so important to create an environment where patients feel comfortable and welcome. 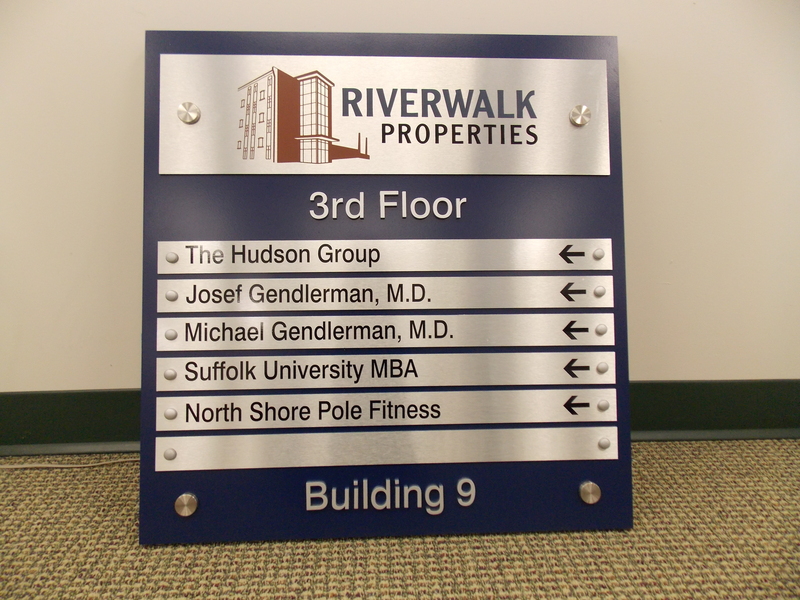 Once inside your building make sure you have effective directory signs if you are a multi-practice building. Make sure your restrooms and public versus non-public areas are clearly marked with ADA compliant signage. 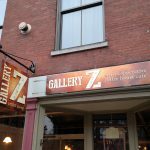 How do signs fit into creating a brand and environment for your practice? In a medical or dental practice there are numerous opportunities to extend your branding. Signs are needed throughout the practice for information and direction. Your Patient Exam Room Signs for example are a fantastic opportunity to brand. You can include your logo or logo colors in the signs. Restrooms, Breakrooms, Doctors’ Offices, Labs all need signs to identify where they are, why not make them part of the branding effort. Utilizing the same fonts, colors and logos. This brings the office together and creates a consistent brand. 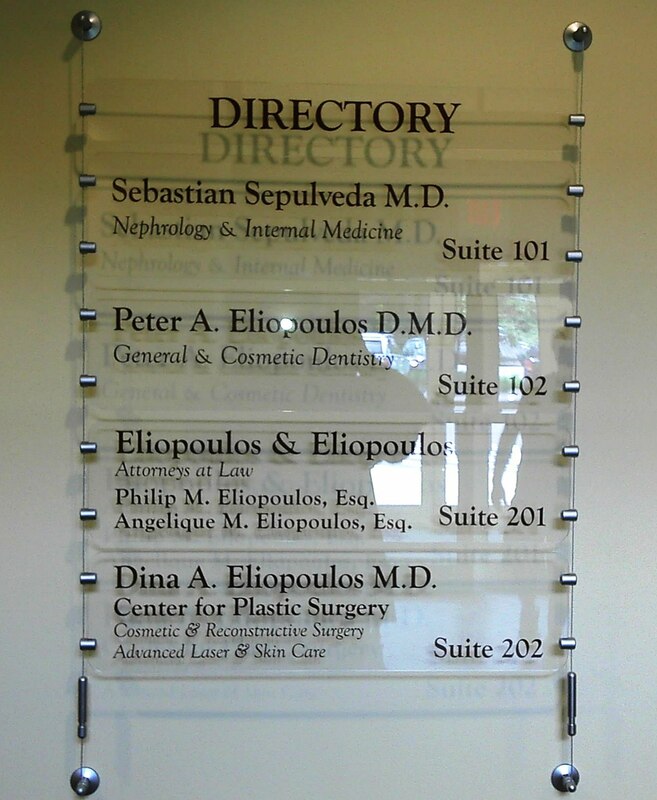 Informational signs are a critical part of the medical or dental office. Information such as where to check in and out, what insurances are accepted, information about co-payments and billing and so forth are very important. 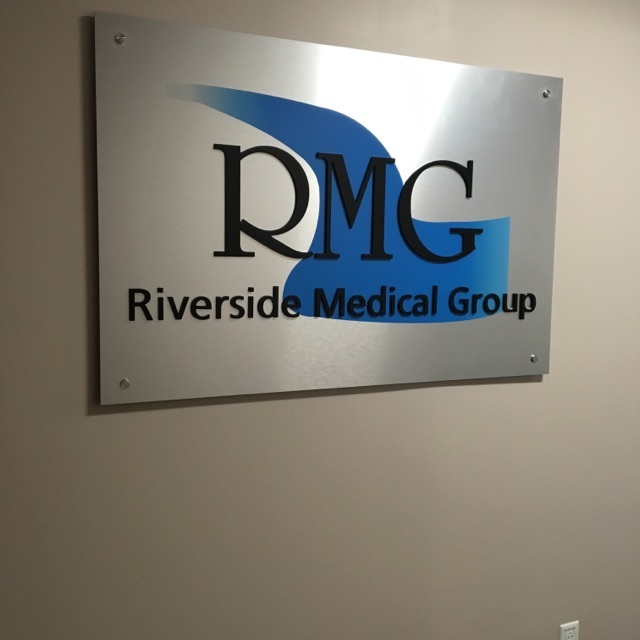 Utilize professionally made signs that coordinate with your office and create an uncluttered, easy to understand message. Many doctors’ offices stick paper signs on their registration windows which creates a cheap and cluttered look. Keep it professional and neat and your patients will more likely read the signs they need to see. Many medical practices are a maze of offices, exam rooms and labs. Make it easy for your patient with sensible directional signs to get them where they need to be. 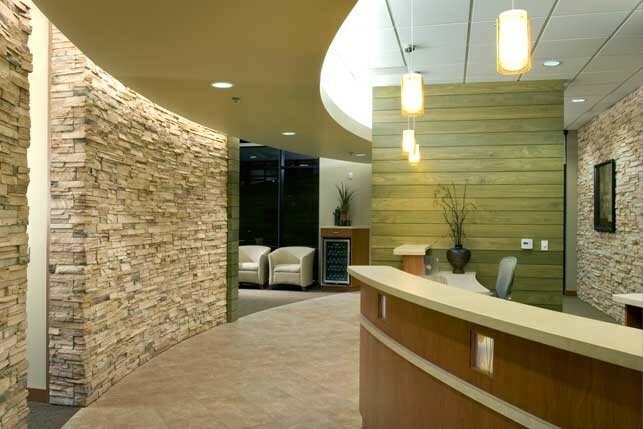 Hallways are another opportunity for branding and creating and environment for your patients as well. 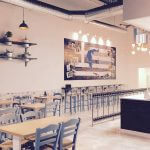 Great full color images, frosted glass displays, poster holders and other decorative signs can add appeal or create an informative environment. Use color coded stripes or pictures of animals to create direction within your hallways. Full color ceiling tiles with soothing photos or graphics above the exam table is another way to add creativity and comfort for your patients. So, as you can see, there are many ways to brand your medical or dental practice. 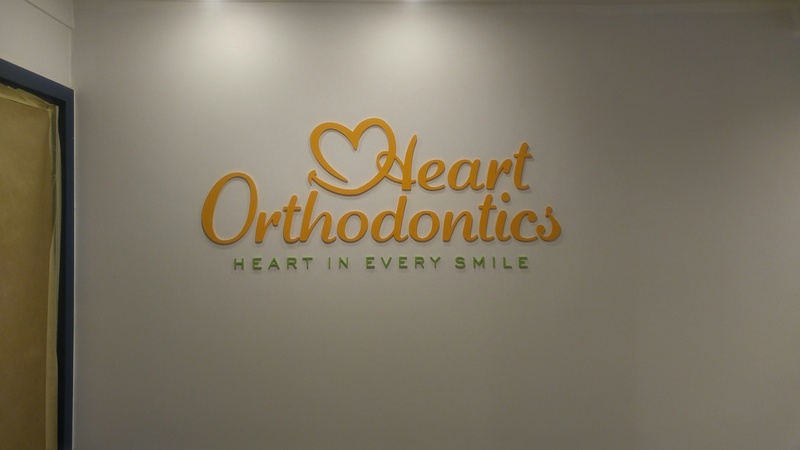 Signs inside and outside of the practice, great full color graphics, easy to read informational and directional signs and so much more make your practice stand out. 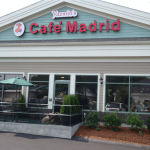 For more information on any of these products please call us at 978-250-9890, or email Ann Durso at ann@signs123.net. 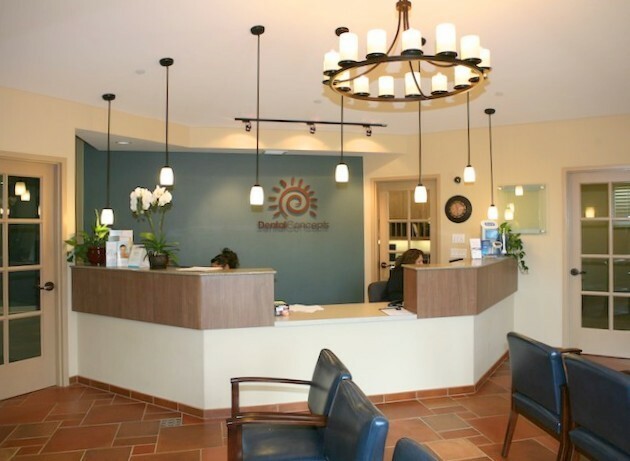 I’ll be happy to visit your practice and see how we can help you create a great environment for you and your patients.